A tip to enhance texture in nuno felt and KY and MI workshop details are finally online! I have managed to get through a lot of the clearing, re-organisation and tidying chores that I blogged about on Monday, not all of them obviously but I have made a dent in the never-ending pile! Thanks for all your encouragement both via comments and through FB, they are definitely much needed to keep me going, I HATE tidying!!! As promised, the full workshop descriptions for the KY and MI workshops in May are now up on the workshop page and I am hoping that we will have a mix of both experienced and improving felters attend. Beginners are really welcome too so please don’t feel you don’t have enough felting under your belt to book a place, everyone is welcome and it makes for a really fun and creative time if we have groups of mixed experience! I have also started to transfer some of my felt pouches across from Big Cartel and into my Etsy shop, only time will tell if this has been a wise descision. Finally for today, Rhonda was wondering how I achieve so much texture in some of my nuno felt pieces. This is something that I will be writing about in the new book with Chrissie but a great tip is to wet out and soap your fibres before you lay out any of your embellishment. Taking this idea a little further for projects such as nuno bags or cushions (items where you have a couple of layers of wool in addition to your fabric), try rubbing the base layer of wool through your bubble wrap to create a ‘skin’ on the surface before laying out your fabric on the top, then wet and soap the fabric lightly and rub again through the bubble wrap. By working like this the wool fibres underneath don’t have as much opportunity to travel through the fabric and this helps to create more texture! You do need to be careful though to rub longer than roll however using this method, otherwise you could try fulling with the tumble dryer, this elliminates both the rubbing and the rollling process!!! I’m going to be discussing my experiences nuno felting using the dryer thoroughly for my section of the new book and I will also be talking about it at the workshops in Lexington and in Plainwell! This entry was posted in America 2012, Book, Book with Chrissie, Felt, Felt for sale, nuno felt, workshops and tagged Felt, felting book, felting workshop, felting workshops, nuno felt, nuno felting, US felting workshops, US workshops, wet felting by Nicola. Bookmark the permalink. 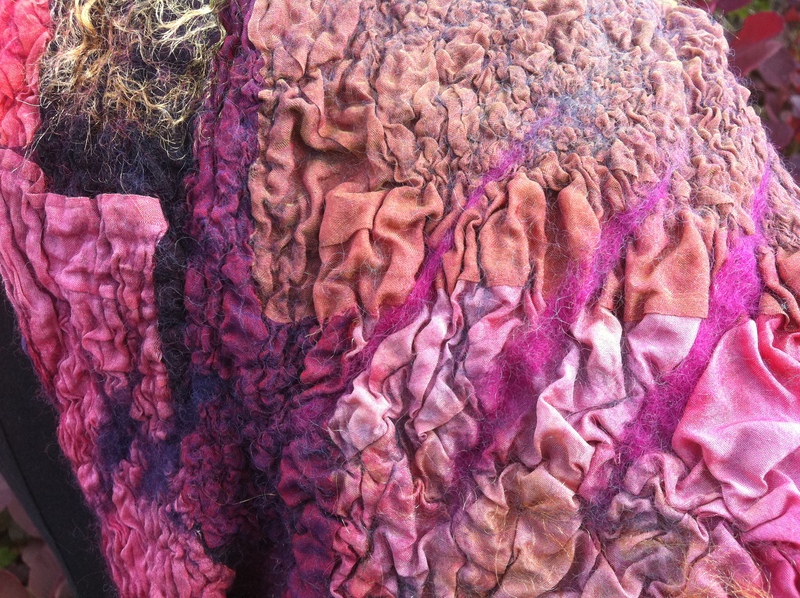 Beautiful nuno-scarf…Love the colors and of course the gorgeous texture that you achieved! Well, the coffee pot is beeping…Hooray! Thank you so much for the explanation Nicola! I can’t wait for the new book to learn even more from you. I’ll try this on my next piece and see how it goes. good morning Nicola……felted piece looks beautiful….just for your info, I do not know if anyone else had a problem, but I have had a struggle to order your book thru BLURB……did it last night, finally but it is not as user friendly as amazon at all. At least on my end. Maybe it is me, I do not know, but at least I have it ordered!!! Have a good day……any day is good when you are felting!!! !